Globalisation has led to the transformation and proliferation of urban borders. Old hierarchies and relations between centres and sub-centres and centres and peripheries are challenged, and new alliances between different places and districts are formed. How can urban design and urban design research meet the challenges of a complex and quickly transforming multi-scalar society? In this article I make three arguments. First, I argue for a territorial perspective that would allow us to better acknowledge how actors of different scales come together and have effects on the level of urban design. Second, I argue that we need to better acknowledge the role of material culture in research on urban design; whereas urban design often benefits from the large-scale perspective of urban morphology, it seldom incorporates the roles of small-scale objects into studies. Finally, I argue that an important task for researchers in urban design is to see how actors of different scales are aligned, and through this alignment produce effects and changes in the ways in which our cities are used. Cochoy, F., Hagberg, J., & Canu, R. 2014. The forgotten role of pedestrian transportation in urban life: Insights from a visual comparative archaeology (Gothenburg and Toulouse, 1875–2011). 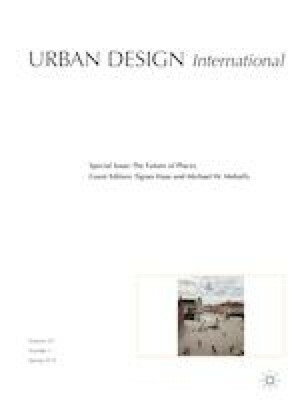 Urban Studies, https://doi.org/10.1177/0042098014544760. Accessed 13 Aug 2014.